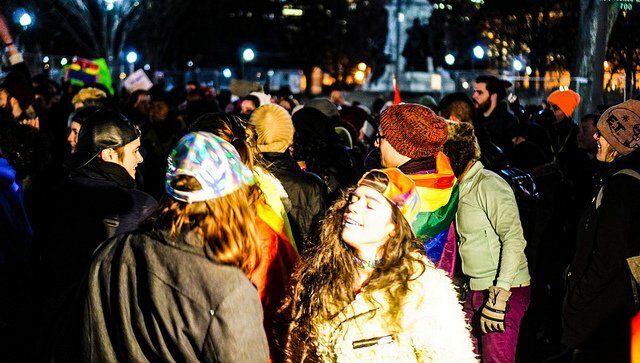 WERK in Solidarity- Celebrating Intersectionality and Resistance, Washington, DC, February 3 2017. Credit: Flickr/Ted Eytan. Some rights reserved. Two recent encounters with fellow lefties have got me thinking. One day I’m at a Leninist meeting talking to a Marxist dude who’s bemoaning the increased popularity of ‘identity politics’ within the left, because it distracts from the ‘real struggle’ of ending material exploitation. And the next day I’m in the basement of a queer bar watching a drag artist shouting to rapturous applause that being ‘non-binary’ means to be free to be whatever you want to be—celebrating personal freedom as a key element of social transformation. Both of these people belong to and identify with the left, but they seem to represent contradictory positions on a question that’s consuming an awful lot of our energies these days: how to respond to the multifaceted realities of oppression and liberation. As a queer non-binary Marxist, I can see where both positions are coming from. On the one hand, I want everyone on the left to understand that we’re all fighting the same struggle—that it’s people’s material wellbeing that matters in the end. On the other hand, everyone within the Left isn’t the same—there are many identities, cultures, sexualities and personal expressions that need to be respected. What are we supposed to do with these tensions? How should the left respond? Conventional wisdom says ‘take one side or the other,’ but that cements internal divisions still further just when we need more unity. It’s better to recognise that this split itself is artificial, and that both positions can learn from the other. Let me explain. Since then, many groups and individuals have developed a radical ‘intersectional’ critique which argues that sexism, racism and other forms of oppression in mainstream society are often reproduced within the left. As legal scholar Kimberlé Crenshaw pointed out in the 1980s, struggles in aid of equality for vulnerable people have often failed to recognise that oppression works along several axes at once. There has been an implicit assumption on much of the left that the working class is white, male, non-disabled and straight, so the obstacles faced by the majority are ignored. As these tensions intensify, it’s very important to clear something up: radical queerness and anti-racism are not forms of identity politics; and class struggle is not free from questions of identity. All forms of social life are already coded by class, race, gender and disability, so there are no forms of politics or struggle that exist outside these structures of social power. The claim that intersectional critiques distract from the ‘real struggle’ or are divisive is based on a fundamental misunderstanding of both intersectionality and socialism: the question is not whether the two can be integrated, but how. These misconceptions are, however, understandable, in part because intersectional critiques have arisen at the same time as a parallel liberal discourse in mainstream society which is about identity politics. This liberal discourse demands the recognition of non-dominant identities in society: that a Black person can be president; that people with disabilities can be entrepreneurs; that women can be corporate CEOs; and that gay people can get married. These demands, which seem obviously desirable and therefore politically neutral, are in fact the product of a particular political ideology, namely liberalism. At the time of its initial development in early modern Europe, liberalism was a new and radical philosophy that broke away from the traditional feudal belief in a highly regulated social order based on monarchy and serfdom. Instead it emphasised the importance of individual freedom and non-interference by the state or by other people in the private sphere. Every person has the right to behave as they see fit unless they actively cause harm to someone else. In response to older beliefs that homosexuality cannot be respectable, for example, or that people of colour are ‘naturally’ different from white people, the assertion that marginalised groups are just as human and important as dominant groups is certainly a form of progress. But what liberalism fails to understand is that it isn’t possible to create a just and free society on the basis of these principles. As many on the left have pointed out (including Marx himself), human beings are deeply social creatures who depend on and co-create each other, so no individual can enjoy absolute freedom and autonomy. Liberals believe that the decisions we make about our lives are personal—that where we work, what we say and how we spend our money, dress and behave is nobody’s business but our own. However, once we realise that people are deeply interconnected these allegedly personal decisions become public and political. Our jobs, for example, are connected to a broader economy that involves a myriad of other workers, consumers and producers. As a result of these interconnections, certain repeated patterns have emerged through the evolution of Western society that have penetrated deep into our personal lives and personalities. For example, British women have not randomly chosen to do two thirds more housework than men. Black women working in white collar jobs are not constantly mistaken for office cleaners by pure chance. And two women per week are not just accidentally killed by men in cases of domestic violence. As these examples show, expressions of power that shape public life also make their way into private thought and action, and vice-versa. Intersectional critiques may look similar to liberal identity politics on the surface, but at their core they are not concerned with assimilating marginalised groups into existing mainstream institutions, language and positions. Rather, the goal is to rethink and reconstruct those institutions altogether. And that effort starts by examining how the structures of power that create and regulate race, class, gender, disabiity and sexuality play out in our own lives and in our own organising, as well as in society more broadly. Hence, instead of encouraging a disabled woman to dominate a panel discussion just as assertively as any non-disabled man, we can organise participatory workshops and train ourselves on how to take part in inclusive discussions. We can rethink our demands and strategies; redesign our posters and websites; change the language we use and our demeanour in meetings and at home; and resist the nation-state by creating more deeply-democratic and participatory forms of governance. In these ways we don’t merely add minorities to existing political practices and structures as liberal identity politics aims to do—we transform them around a much deeper understanding of diversity. By the same token, the claim that non-binary queerness is solely an expression of individual freedom is based on a liberal misunderstanding. For me, being queer is not just a private preference, it’s about how I behave, know, talk, organise, work and live. Being queer is a necessary response to structural oppression; a vehicle to confront and resist the ways in which capitalism, racism and patriarchy seep into the most intimate aspects of my life. Queerness is not freedom from social interference, it’s the opposite—an active and responsible engagement with the structures of social power. Therefore, rather than bemoaning the increased popularity of identity politics we should rethink our forms of organising, core questions and priorities. We must let go of the notion that the working class—or the ruling class—are homogenous. To include the concerns of many women, people of colour, queers and disabled people we must organise in the home, in community centres and night clubs, with accessible toilets and hearing loops, for alternatives to racist and violent policing, against gender norms and borders, and with sensitivity, emotion and attention to the needs and voices of specific groups as well as the goals that unite us.